The curatorial collective of Don't Follow the Wind developed a 360 degree video, A Walk in Fukushima, to make visible some of the inaccessible, irradiated sites of the exhibition inside the Fukushima exclusion zone, however the artworks in the project remain unseen, obscured by bodies of the artists and curators. The video includes the account of a displaced resident whose home is heavily contaminated and his ambivalence about having worked for TEPCO the power company which own the nuclear plant that had a meltdown. The video was displayed inside headsets made by the mother, father and grandmother of artist Bontaro Dokuyama who all live in Fukushima near the exclusion zone in an area deemed 'safe' for inhabitation but the low level contamination has radically changed their everyday way of life. 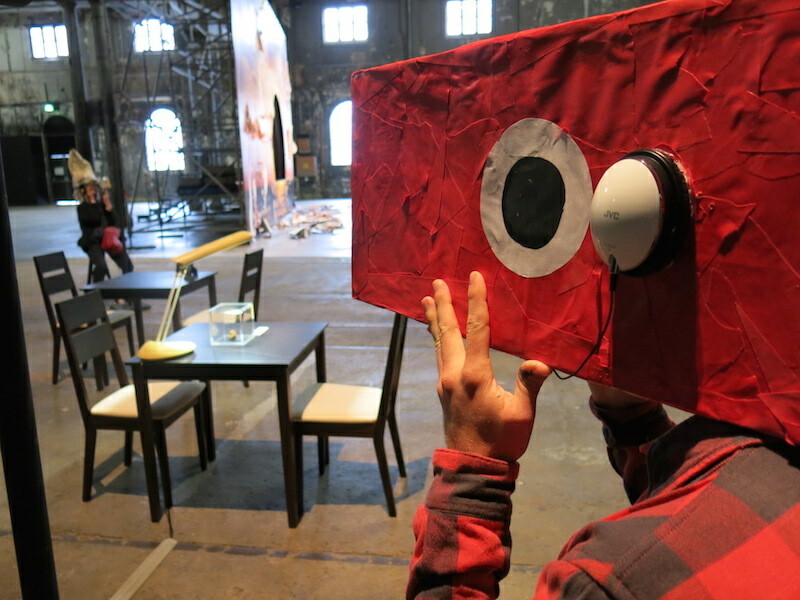 They constructed the headset with objects based on their present needs and desire to find a more ordinary life in the future. 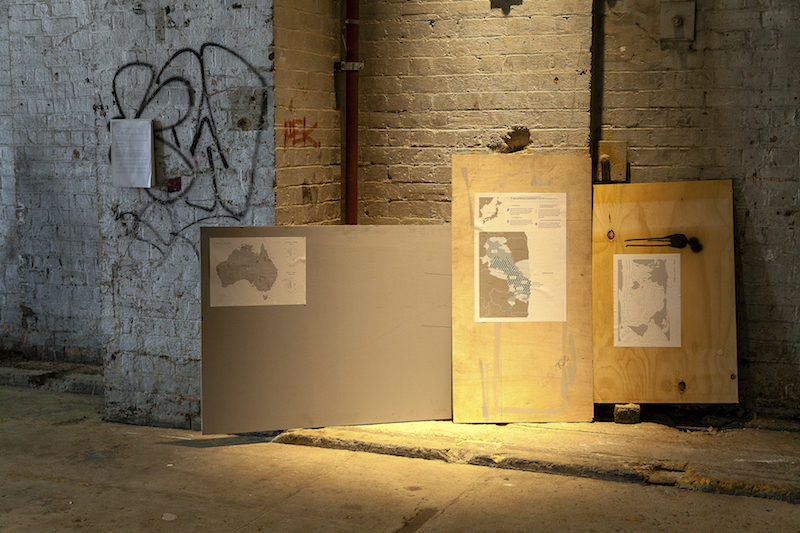 As part of the installation decontaminated furniture from an unopened cafe on one of the sites of Don't Follow the Wind in the zone, which was planning to hold its grand opening on 8 April 2011 but has been postponed indefinitely due to the disaster. 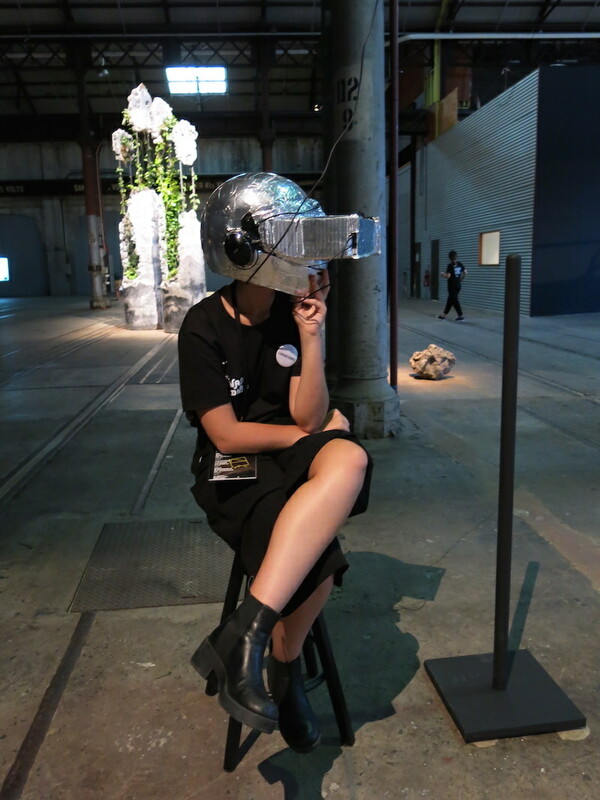 Don't Follow the Wind: A Walk in Fukushima 360 degree video, headsets, cafe furniture from Fukushima, Australian uranium, maps, installation commissioned by the 20th Biennale of Sydney, view at Carriageworks, 2016. 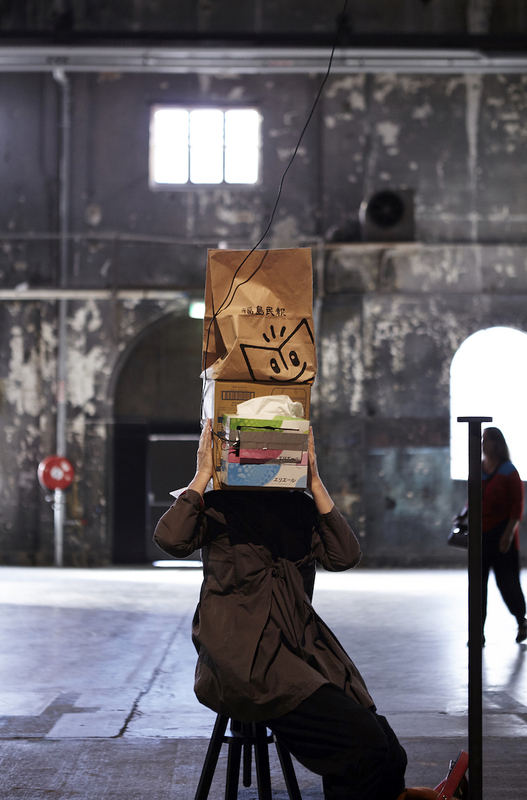 Don’t Follow The Wind: A Walk in Fukushima 360 degree video, headsets, cafe furniture from Fukushima, Australian uranium, maps, installation commissioned by the 20th Biennale of Sydney, view at Carriageworks, 2016. Photograph by Zan Wimberley. 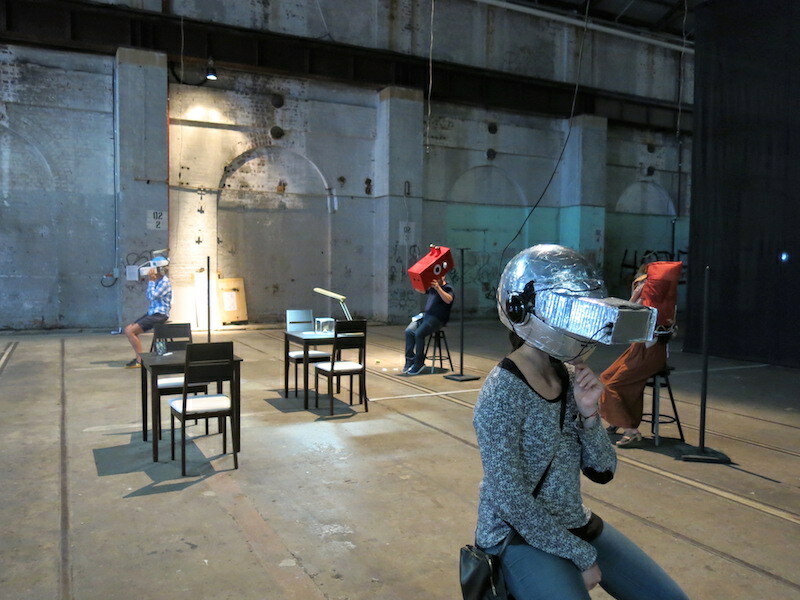 Don’t Follow The Wind: A Walk in Fukushima 360 degree video, headsets, cafe furniture from Fukushima, Australian uranium, maps, installation commissioned by the 20th Biennale of Sydney, view at Carriageworks, 2016. 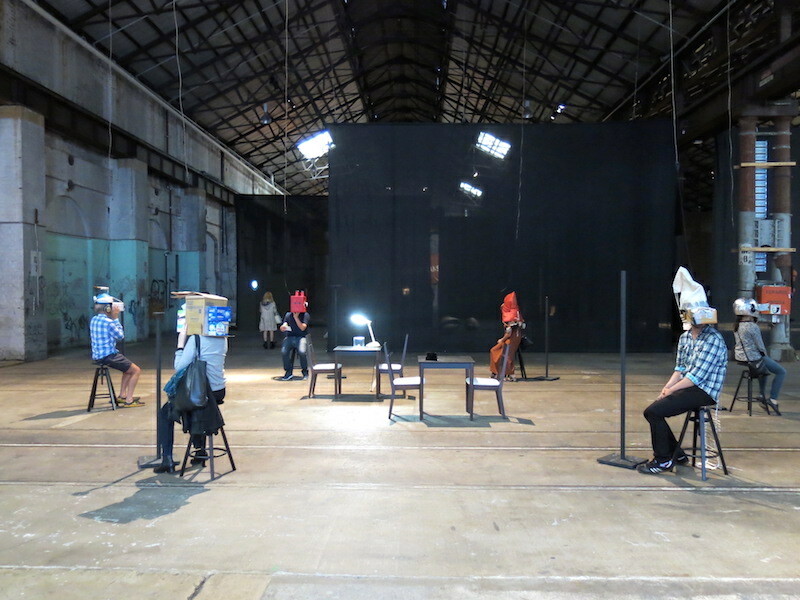 Don’t Follow The Wind: A Walk in Fukushima 360 degree video, headsets, cafe furniture from Fukushima, Australian uranium, maps, installation commissioned by the 20th Biennale of Sydney, view at Carriageworks, 2016. Photograph by Leïla Joy. 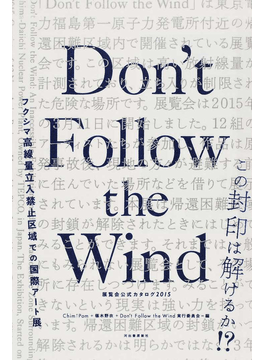 A traveling exhibition related the ongoing inaccessible exhibition Don't Follow the Wind, taking place inside the restricted Fukushima exclusion zone. As there is no clear timeline for public access to the sites in Fukushima, perhaps 5 years, 10 years, or decades - a period of time that could stretch beyond our lifetime, the Non-Visitor Center is a migrating outpost curated by Chim↑Pom, Kenji Kubota, Eva and Franco Mattes and Jason Waite. The Non-Visitor Center included an Information Counter designed by Tsubasa Kato staffed by former residents from Fukushima. 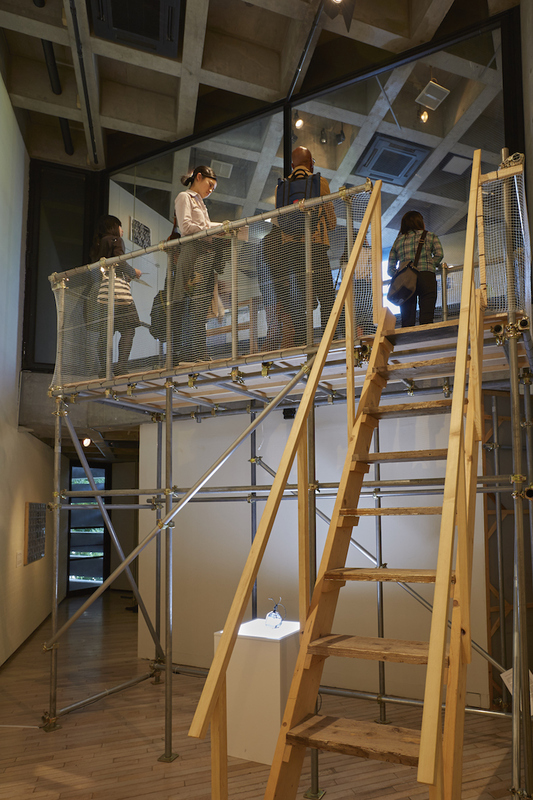 The main section was the Interpretation Station which an inaccessible exhibition inside of Watari that could only be seen by climbing scaffolding and looking through a window into the gallery which contained new related works to the projects in Fukushima developed by the 12 participating artists. 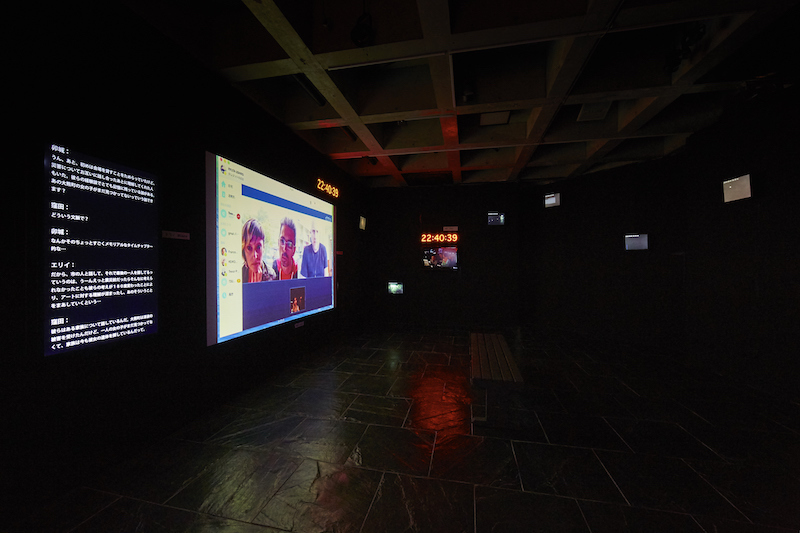 Filmmaker Sion Sono created an installation around a discussion between the participating artists, also included in the show live streaming camera feeds from Fukushima and archival material from the project. 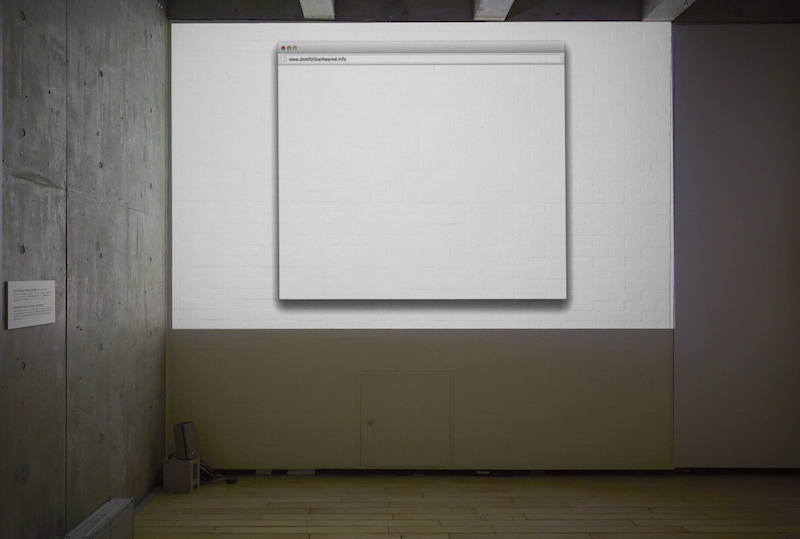 Don't Follow the Wind: Non-Visitor Center project website with collective audio introduction, installation view at Watari Museum of Contemporary Art, 2015, photograph by Kenji Morita. Don't Follow the Wind: Non-Visitor Center blocked entrance to Interpretation Center, installation view at Watari Museum of Contemporary Art, 2015, photograph by Kenji Morita. Don't Follow the Wind: Non-Visitor Center scaffolding for viewing Interpretation Center, installation view at Watari Museum of Contemporary Art, 2015, photograph by Kenji Morita. 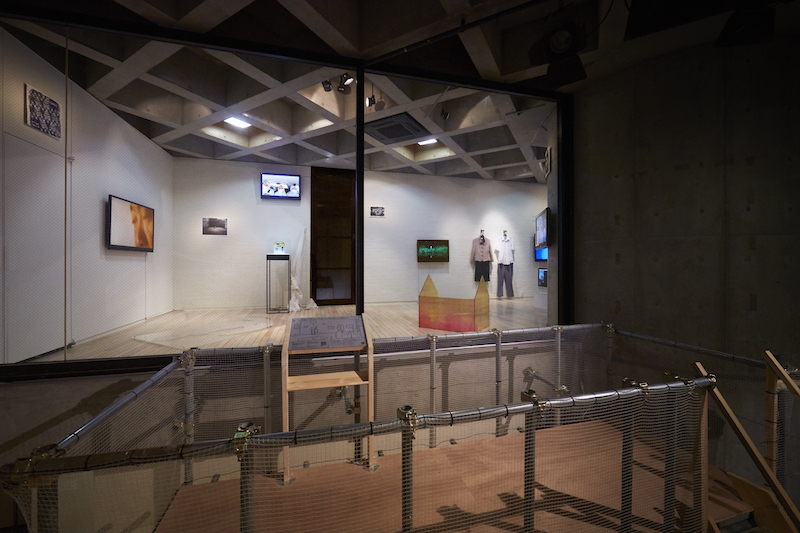 Don't Follow the Wind: Non-Visitor Center view into Interpretation Center, installation view at Watari Museum of Contemporary Art, 2015, photograph by Kenji Morita. 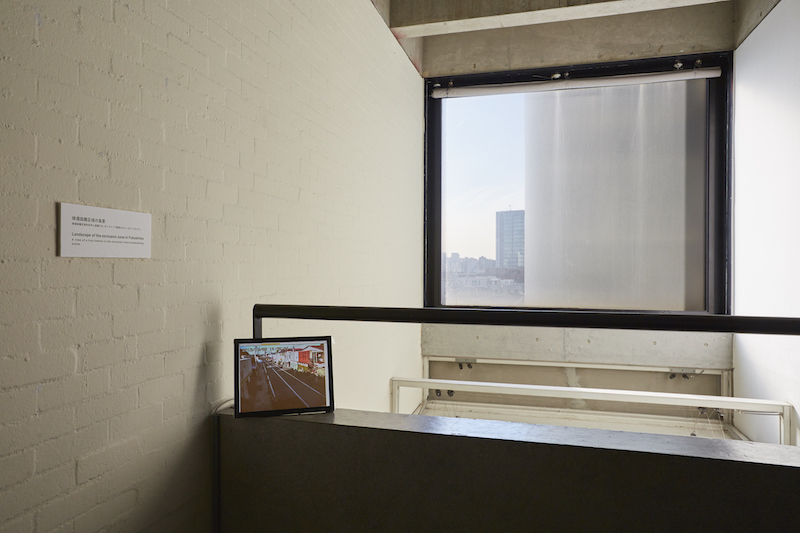 Don't Follow the Wind: Non-Visitor Center live camera feed from Fukushima with Tokyo skyline, installation view at Watari Museum of Contemporary Art, 2015, photograph by Kenji Morita. 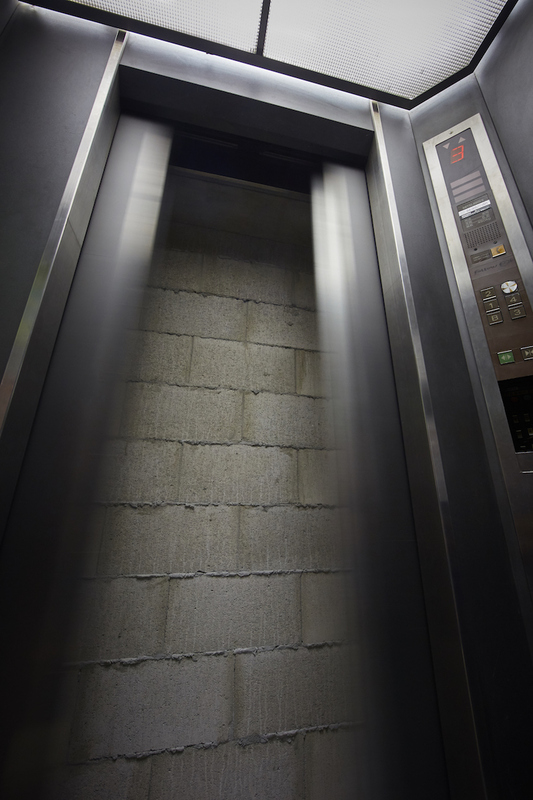 Don't Follow the Wind: Non-Visitor Center, 22:19:43-23:04:40 by Sion Sono, installation view at Watari Museum of Contemporary Art, 2015, photograph by Kenji Morita.